Regina Spektor will perform at 8 p.m. Nov. 14 in Pershing Arena for the Student Activities Board (SAB) fall concert. Tickets are $5 with a Truman student ID and $15 for general admission and are available in the SAB Office in the lower level of the Student Union Building or online at http://sab.truman.edu/store. A veteran of New York’s anti-folk scene, songwriter Spektor makes quirky, highly eclectic and always personal music. Born and raised in Moscow until age nine, she listened to her father’s bootleg tapes of Western pop and rock and also learned to play piano. She and her family moved from Russia to the Bronx, N.Y., where she was immersed in American culture. Spektor further developed her classical piano training by attending the SUNY Purchase Music Conservatory. She self-released her debut album “11:11” in 2001. With the strength of her frequent performances and another self-released album, 2002’s “Songs,” Spektor developed a following that included Alan Bezozi, the drummer for They Might Be Giants. He introduced Spektor to the Strokes’ producer, Gordon Raphael, and both worked with Spektor on her third album, “Soviet Kitsch.” Initially self-released like her other work, “Soviet Kitsch” eventually found a wider release with Sire Records. Tours with the Strokes, Kings of Leon, Mates of State and the Moldy Peaches’ Kimya Dawson further raised Spektor’s profile. In 2006 Spektor released her first album of original material for Sire, “Begin to Hope,” which went gold in the U.S. Doors open at 7:30 p.m. for the Nov. 14 performance. Jupiter One will be the opening act. The University and Community Relations Committee of Truman’s Staff Council hosted its annual “Head to Toe” clothing drive at the end of October to collect warm outerwear for local children. The Truman community filled decorated boxes around campus with 16 coats, 69 hats, seven sweaters/sweatshirts, 71 pairs of mittens/gloves, 27 scarves and three pairs of boots in sizes ranging from infant to teenager. Items will be donated to the neighboring schools and to the Kirksville Day Care Center to be distributed to children in need. The colorful boxes were decorated using artwork done by local school children from Countryside Christian Church and Life Church School. The council would like to say a big thank you to the “I Think I Can Foundation” for working with key contacts in the schools to make sure the clothing is properly distributed. Also, the committee would like to recognize Connie Jacobs (Pickler Memorial Library) and her husband; Dee Dee Moore (Provost’s office); and Brennen Bushnell (Pickler Memorial Library); as well as Howard Worcester (Truman Recycling) for locating and transporting the large boxes. As always, the biggest thanks goes to the Truman community for having the true spirit of compassion. Another opportunity to give will take place from 12-4 p.m. Dec. 2 when the University and Community Relations Committee sponsors a blood drive in the Student Union Georgian Room. Go to http://www.givelife.org to sign up for an appointment. In anticipation of the holidays, the University and Community Relations committee of Staff Council will also bring back the well-received Holiday Door Decorating Contest. Contact Linda Davenport, lindadav@truman.edu, by Nov. 20 to enter your office or department door in the contest. The doors must be completed and ready to be judged by Dec. 4. Winners will be announced Dec. 11. GlobeMed is working with Pickler Memorial Library throughout the month of November to educate the Truman community on what the organization does abroad. A photo exhibit featuring GlobeMed projects is currently on display in the Library Gallery Room. “Through My Eyes: Global Health Oppression in the Hispaniola Island,” features powerful and beautiful photos blown up to poster size, along with cases containing information about the areas in which GlobeMed works. Materials illustrate the mothers in Haiti directly affected by the Truman GlobeMed chapter’s partnership with Maison de Naissance, as well as the sugarcane communities affected by the group’s health education projects in the Dominican Republic. In 2008, Truman GlobeMed students traveled to the Dominican Republic on two separate occasions to teach maternal health education among sugarcane field workers. The Investing in Students fund at Truman has received a $3,500 donation courtesy of Roktoberfest, a fundraising event organized by Sigma Tau Gamma fraternity, in association with Blue Key, Cardinal Key and Tau Lambda Sigma. Members of Sigma Tau Gamma present President Darrell W. Krueger with a check for $3,500 for the Investing in Students fund. 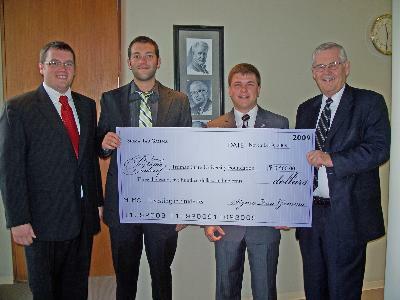 Pictured, from left: Ryan Cochran, Sigma Tau Gamma president; Kyle Betts; Andrew Bedwell; and University President Darrell W. Krueger. Approximately 350 people attended the second annual event, which took place Oct. 23 at the Journal Printing Building in downtown Kirksville, courtesy of the Wooden Nickel. Event organizers announced the philanthropic effort raised $7,000, and proceeds were divided equally between Truman’s Investing in Students fund and the National Fibromyalgia Association. The University created the Investing in Students fund earlier this year in response to the growing financial burden placed on students and their families. The fund was established with a $30,000 gift from President Darrell W. Krueger and his wife Nancy. University constituents, including faculty, staff, alumni, friends and corporations, have also provided support for the initiative. Gift commitments to the fund now total more than $200,000. MAE and chemistry graduate student, Jessica Michael, senior chemistry majors Rick Knopick and Minh Ho, junior chemistry major Laura Tvedte and sophomore chemistry major Emery Brown presented results of their research at the recent Midwest Regional Meeting of the American Chemical Society in Iowa City, Iowa. They were mentored, respectively, by professors David Wohlers, David McCurdy/Brian Lamp, and Russell Baughman/Kenneth Smith. Faculty in attendance included Dana Delaware, Baughman, Smith, McCurdy and Wohlers. Michael was supported by an NSF-RDE grant. Brown, Ho and Knopick were sponsored by Merck Pharmaceuticals and The American Association for the Advancement of Science. Tvedte was sponsored by the NSF-STEP program. Truman Chemistry alumni presenters or co-authors were Ted Bryan (1990), Kurt Hoeman (2003), Scott Klasner (2004), Jeff Lange (2004), Andy Maerz (2007) and Jena Whetstine (2004). One pound was the only thing standing between two Truman students and the chance to compete for $50,000 worth of prizes. Mike McCarthy and Spencer Clark, members of the University’s Fishing Club, competed in the National Guard FLW College Fishing Challenge Oct. 31-Nov. 1 in Murray, Ky.
Mike McCarthy (left) and Spencer Clark (right) weigh their fish during the National Guard FLW College Fishing Challenge. The Fishing Club members finished in sixth place out of 20 teams, narrowly missing a shot at $50,000 in prizes and a spot in the College Fishing National Championship. McCarthy and Clark finished in sixth place out of 20 competing teams. After two days of competition the duo’s combined total of six fish came up one pound short of fifth place, which would have given them the right to compete in the final round for a chance to win $25,000 for Truman along with a $25,000 boat in school colors for the Fishing Club. 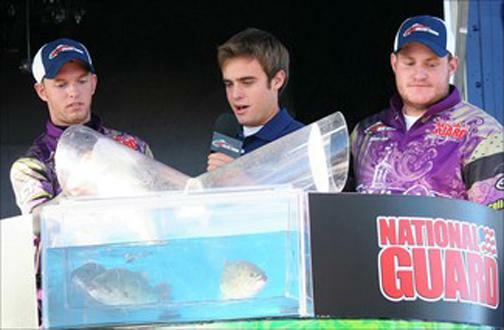 A fifth place finish would have also given the Truman Fishing Club a spot in the College Fishing National Championship in April 2010. LiFT, the International Student Affairs Office, West Campus Suites and the Multicultural Affairs Center will sponsor “Hello Vietnam!” at 6 p.m. Nov. 15 in the West Campus Suites Multipurpose Room. The event introduces a piece of Vietnamese culture through selective cuisine, music, costume and friendly people. The dinner is buffet-styled, served by Vietnamese and American LiFT members in Vietnamese costumes. A course of four main dishes, dessert and beverages is carefully chosen to represent a typical Vietnamese meal and to go well with American palate. Recipe books of all dishes are available for those who are interested in duplicating the dinner. “Hello Vietnam!” is only the beginning of introducing a part of Vietnamese culture to the community. The organizers will try to make it the best possible so its sequels will be much anticipated. The meal costs $5 per person. All profits from “Hello Vietnam!” will go toward LiFT’s fund for child sponsorship and emergency children funds. Reminiscent of the popular movie “Night at the Museum,” great speeches from history and the movies will come to life at 7 p.m. Nov. 17 at the Ruth W. Towne Museum and Visitors Center. Approximately 35 communication students from COMM 270 and 170 will portray speakers or characters in an entertaining program organized by Barry Poyner, professor of communication, and sponsored by the Communication Club (NCASC). At any given point, about half of the students will be in character. This will allow the other student performers to move around and enjoy student speeches as well. The public is welcome to walk through the museum at their own pace. Each student presentation is about five minutes. Students will share brief insights about the speakers/characters and the rhetorical situation, in addition to performing excerpts from the speeches. Students from COMM 270 will portray speakers from the Top 100 Great Speeches of the 20th Century, such as Franklin Delano Roosevelt’s Declaration of War. NCASC is committed to enriching the lives of undergraduate communication major and minors by promoting the study and application of communication principles through educational and social functions. Interested students may contact club president Nathan Vickers, nav437@truman.edu. Beta Theta Pi is offering two $250 Men of Principle Scholarships for those interested in rushing in the spring. Deadline to apply is 11:59 p.m. Nov. 11. Interviews will take place in December. Applications are available online at http://www.zeta-xi.com/rush/men_of_principle_scholarship. For more information, contact Jon Grush at jmg6242@truman.edu. The Truman Women’s Basketball team would like to invite your daughter, niece or granddaughter to join the “Lil Pup Club” this season. The “Lil Pup Club” is a program that gives young girls the opportunity to be an honorary member of the team for one home game this season. As a member of the “Lil Pup Club,” each individual will be introduced prior to tip-off, have the opportunity to sit on the bench during the game and receive an official complimentary club T-shirt. If you have a daughter, niece or granddaughter currently in grades 3-8 who would be interested in participating, contact Taira Roth at troth@truman.edu or 785.7362. Summer Internship in Independence, Mo. Lander is a blogger and best-selling-author most known for his book, “Stuff White People Like.” The book is a humorous anthropological study of upper-middle-class white culture and a handbook to succeeding in modern, urban, white society. An advanced ticket can be picked up in the SAB Office on the first floor of the Student Union Building. Tickets are free with a student ID or $2 for general admission. Tickets will be sold at the door if the event is not sold out. The Truman Public Relations Office is now accepting résumés for the full-time spring 2010 internship position. To apply, send a résumé, two writing samples and contact information for two on-campus references to the Public Relations Office, McClain Hall 101, by 4 p.m. Nov. 17. For specific questions about the internship, contact Heidi Templeton at heidi@truman.edu. The National Collegiate Honors Council will be accepting applications for the Dr. John and Mrs. Edythe Portz Fellowship. The highly competitive award of up to $7,000 is open to all students at any of the more than 800 member institutions of the NCHC in the U.S. and beyond. The Portz Fellowships support original and extended interdisciplinary projects for up to 18 months. Applications are available at http://www.nchchonors.org. For more information contact Dr. Patrice Berger at pberger1@unl.edu or 402.472.5425. Monica Barron will explain “Road Trip New Mexico,” a cluster of three courses (ENG 418 Southwest Lit, JINS 315 Nuclear Weaponry and any Spanish course at any level) and a spring break road trip to Taos, Los Alamos and Santa Fe, N.M. See the course website at http://air.truman.edu/roadtrip. All proceeds go to Maison de Naissance, a birthing home in Haiti. Tickets are $20 per person. Contact truman@globemed.org if you would like to attend. Twelve papers on a variety of topics within philosophy and religion will be presented throughout the day. Lunch is free to all participants and attendees. The keynote address by Potthast will be given during the luncheon. Free for any student, staff or faculty members. Free patches, gum and physician consultations will be available at all classes. E-mail ccox@truman.edu for more information. The application for the 2010 competition can be found at http://www.glamour.com/about/top-10-college-women. Direct any questions regarding the competition to atttcw@glamour.com. Deadline for entries is Dec. 1. Truman State University’s virtual private network (VPN) is available to students, faculty and staff to provide a secure network connection between your off-site computer system and resources on the local Truman network. You can use the VPN to connect to Truman network drives (like W: or Y: drives), access the restricted library databases and connect to most other Truman network resources when you are away from the Truman campus. If you have any questions, please contact the ITS HelpDesk at 785.4544. • The VPN will not make your off-campus connection faster. A VPN provides a secure connection, not a faster one. Your VPN connection speed to Truman will be slightly slower due to the additional overhead. • You must have a broadband connection to use the VPN. It will not work over a dial-up connection. • Do not use the VPN while on campus. The VPN is for off-campus use only. The Advertising and PR club is hosting a week of events sponsored by various organizations affiliated with the Communication Department. This week will feature a night of events sponsored by a prominent organization under the Communication Department, including: Lambda Pi Eta; Ad and PR club; The Society of Professional Journalists; Detours; The Index; KTRM; and News 36. Come join Lambda Pi Eta for a potluck dinner at the University Club at 6 p.m. The dinner is free and this event is open to students and faculty/staff outside of the Communication Department. Ad and PR club Peer 2 Peer Networking Workshop ... How to Get an Internship! Come join the Ad and PR club for a networking workshop on how to get an internship. Seniors within the Communication Department will share their internship experiences and network with other students on how to obtain those internships. Also, students in the Ad and PR club who attended a PRSA conference in Kansas City will share their findings on networking. Students featured had internships with: Target; The City of St. Peters; Fox 2 in St. Louis; PBS/KETC Channel 9 in St. Louis; Kirksville Daily Express; Greek Life; Career Center; Public Relations Office at Truman; and many others. Come join the members of the Society of Professional Journalists as well members of various organizations within the Truman Media Network to hear personal accounts of their experiences with the media. Also featured is student Tawanda Kanhema on his experiences as an investigative journalist in Zimbabwe. For more information contact Kristyn Potter at kmp292@truman.edu. ALL parking east of Pershing Building will be closed Nov. 23. Contractors will be fencing the area. Taner Edis, associate professor of physics, had a chapter, “An Ambivalent Nonbelief,” published in R. Blackford & U. Schüklenk, eds., 50 Voices of Disbelief (Wiley-Blackwell, 2009). The deadline to submit McNair Program applications is Nov. 10. Visit http://mcnair.truman.edu or contact the McNair Office at 785.5393 with any questions about the deadline. Alpha Phi Omega will sponsor a Blood Drive from 10:30 a.m.-5:30 p.m. Nov. 11-12 in the Student Union Building Georgian Rooms. Walk-ins are welcome all day or appointments can be made at http://www.givelife.org. The Center for Teaching and Learning welcomes Scott Alberts as the Weekly Lunch Series speaker at 12:30 p.m. Nov. 11 in the Student Union Building Spanish Room. Alberts will discuss the Portfolio Project. The Center for Student Involvement (CSI) welcomes all faculty and staff to nominate student leaders on campus for the Golden Leadership Award (GLA) for the month of November. The nomination form can be picked up in the CSI or completed online at http://csi.truman.edu. The nomination deadline is 5 p.m. Nov. 11. The CSI is located on the first floor of the Student Union Building. The next event in the Global Issues Colloquium, “Studying Internationally,” will take place at 7 p.m. Nov. 12 in Magruder Hall 2001. During the presentation, a panel of Truman’s international students will give a glimpse into what it is like to study in the United States. They will also share what schooling is like in their home countries and how it compares or contrasts with education in the U.S. Sponsored by the Center for Teaching and Learning. Cold Turkey Tobacco Cessation Classes continue at 8 p.m. Nov. 12, Nov. 19 and Dec. 3 in Pershing Building 301. Free patches, gum and physician consultations will be available at all classes. E-mail ccox@truman.edu for more information. A Student Union Building Technology Workshop will take place from 1-2 p.m. Nov. 13 and will begin in the Conference Room on the upper level of the Student Union Building. The workshop is open to all students, faculty, staff and visitors. To register, visit http://sub.truman.edu/register/classlist.asp. Send questions to Scott Casey, Student Union Building technology manager, at stc3331@truman.edu. Truman Society of Dance Arts will host “Dance Fusion Recital Fall 2009: Pick Your Flavor,” at 7 p.m. Nov. 13 and 6 p.m. Nov. 14 in Baldwin Auditorium. This two-night, family-friendly dance recital will showcase a variety of dancing and include performances by Swingers, USMED, Showgirls, Ceilidh Club, SUEDE, Highstreet, Poi, Alpha Phi Alpha and Illusionz. Admission is free. The Communication Disorders (CMDS) Department will host a Graduate Student Recruitment Day from 10 a.m.-2 p.m. Nov. 14 in Barnett Hall 1400. All prospective students interested in pursuing a master’s degree in Communication Disorders from Truman are invited to attend. Information regarding the CMDS graduate program, the profession, employment opportunities and funding for graduate school will be provided along with the opportunity to meet faculty, alumni and students of the program. RSVP to Laura Winkelman, graduate recruitment day coordinator, at law4281@truman.edu. Upward Bound will host an informational meeting about employment opportunities for spring and summer 2010 at 5:30 p.m. Nov. 16 in the Student Union Building 3204. Come enjoy free treats, hear testimonials from past mentors and participants in the program and learn how Upward Bound can benefit you. Contact Alex Boles at alexboles@gmail.com for more information. The Career Center is hiring for the spring semester. If you are a scholarship or work study student, consider applying for the In-Center or Public Relations teams. Directions and applications are on https://trupositions.truman.edu/jobs.asp. There is a required preview session Nov. 16 in the Career Center from 6-7 p.m. Students should turn in materials to the Career Center by 5 p.m. Nov. 20. The women of Cardinal Key will host a Fall Interest Party at 6:30 p.m. Nov. 17 in the Student Union Building Alumni Room. Cardinal Key is a national honor society comprised of 25 women whose focus is service both on Truman’s campus and within the Kirksville community. The Women’s Resource Center will sponsor Coffee and Consciousness at 7 p.m. Nov. 17 at the University Club. The topic, “Disability and Sexuality,” will explore ways in which not able-bodied people have become one of the most sexually oppressed groups, the issues people face and how awareness could be raised. “La fille bien gardée,” by Labiche will be performed in French by Truman French students at 8 p.m. Nov. 18-19 in the Student Union Building Activities Room. A copy of the script can be read online at http://www2.truman.edu/~plobert/. For more information, contact Patrick Lobert, professor of French, at 785.4062 or plobert@truman.edu. Career Finder, the newsletter for the Career Center, is now available at http://career.truman.edu/Career%20Finder/Newsletter.pdf.